There are certain equipment that are indispensable to camping. Examples are a first aid kit, tents or hammocks, sleeping bags, and a hammer. Forgetting to bring along these crucial camping gears will ultimately bring about a horrible camping experience. What are the basic camping gears? Although camping gears might be innumerable depending on the scheduled camping activities, the above-listed are some of the most essential. That being said, our focus here will be on camping tents. Since nighttime is inevitable – even in the woods or wherever you are camping, coming with a tent (or hammock) in your backpack cannot be overemphasized. There are many forms of camping, and with the advancements in technology in this sphere of activities, there are now several alternatives to tents. However, it will take forever before tents are completely replaced by the recent alternatives. The indispensability of tents in camping is due to various reasons. The following are some of the major reasons why tent camping remains the best, and why tents cannot go extinct. Different tent sizes: There are various types of tents depending on the number of campers. In addition, tents come in various prices, making it accessible to virtually everyone, regardless of your budget. Slightly better sleep: During rainfall, it is definitely better to sleep under the shelter of a tent than to stay unprotected in a hammock. As a result, you’ll sleep better inside a tent during downpours. Better protection: Drawing from the previous point, we can see that sleeping in a tent is way better than sleeping in a hammock in terms of protection from the elements. Since camping involves staying outdoors exposed to the wild, staying in a tent offers a sense of protection against wild animals and the elements. Accommodation: Unlike a hammock, which is commonly designed to accommodate a single person, an average size tent can accommodate a minimum of two campers. No need for trees: If you are hammock camping, there is a need for you to find at least two trees to hang the hammock. This becomes a disadvantage when your campsite is in a place with few or no trees. 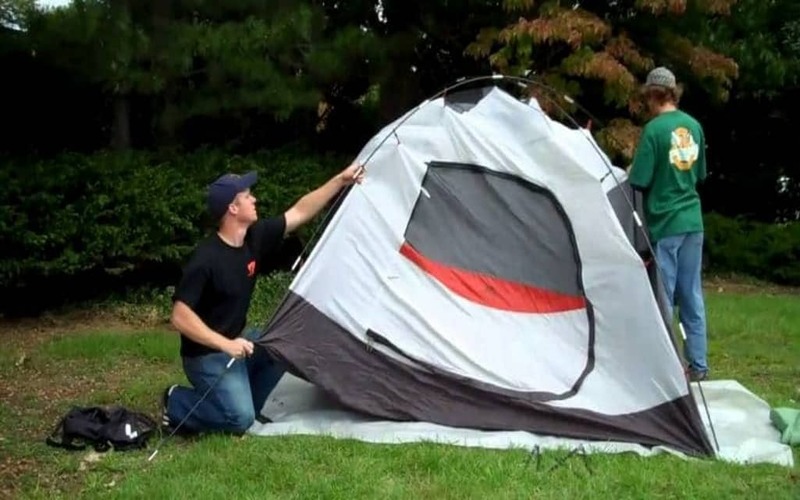 With a tent, there is no need to worry about this as you can pitch your tent on the ground. Easy learning curve of the setup: Although subsequent setups may be easy, setting up a hammock for the first time can be tricky and quite frustrating. Tent camping, on the other hand, does not pose this challenge. The gentle learning curve of setting up a tent makes it the go-to choice for many campers. Do not stock food around or in your tent. Also, try not to have your supper in the tent. Get a picnic table and have your luncheons and dinners there, otherwise critters will smell your food and literally tear your tent for the food. After you return from camping, make sure that you put up your tent in your backyard and air it out. This leads to the prevention of fungus along with mildew. Store the tent in a dry and loose space and do not stuff it in a sack. You can utilise your stuff sack to pack the tent when you shift from one camp ground to another. Go for lighter tents. If you are backpacking then go for tents that weigh less than 2 pounds/person. Opt for those that proffer you the maximum headspace and yet prove packable! Tent camping remains a popular type of camping, and will still remain so in the foreseeable future. Spacious and perfect for car camping with your close ones especially during summer, tents prove highly beneficial till date. Be it the larger one for family campers or the lightweight ones for solo hikers, tents should be cozy places to snuck in after a hectic day of adventure. They are the hubs of solstice making your summertime an enjoyable period.